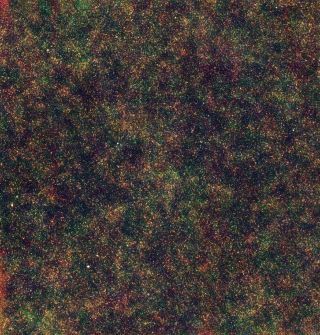 False color image of the Lockman-hole area of the sky at infrared wavelengths as imaged by the Herschel Space Observatory. The mottled effect reveals the spatial distribution of the distant starburst galaxies generating the cosmic infrared background. Creating stars is a lot like cooking: You need the right ingredients in the proper proportions to make everything shine. One of those ingredients is dark matter, and a new study has pinpointed the lower limit of this elusive substance needed to ignite a frenzy of star formation: a mass equal to 300 billion of our suns. Dark matter is an invisible substance that astronomers can measure only indirectly by its gravitational influence over regular, visible matter. But while it has yet to be directly observed, it's a vital ingredient for galaxies in the act of forming stars. And if 300 billion solar masses' worth of dark matter sounds like a lot to start with, scientists say it is actually about 10 times less than the amount previously estimated. "If you start with too little dark matter, then a developing galaxy would peter out," said the study's leader, Asantha Cooray of the University of California, Irvine, in a statement. "If you have too much, then gas doesn't cool efficiently to form one large galaxy, and you end up with lots of smaller galaxies. But if you have the just the right amount of dark matter, then a galaxy bursting with stars will pop out." The findings require a re-examination of current galaxy formation and evolution models, researchers said. Astronomers previously thought galaxies needed around 5,000 solar masses' worth of dark matter to kick-start star formation. distribution of dark matter when the universe was about 3 billion years old, obtained from a numerical simulation of galaxy formation. The left panel displays the continuous distribution of dark matter particles, while the right panel highlights the dark matter halos for the formation of star-bursting galaxies with a minimum dark matter halo mass of 300 billion times that of the sun. Cooray and his colleagues used the European Space Agency's infrared Herschel Space Observatory to measure the amount of dark matter needed for the birth of some of the first galaxies in the universe. They measured light from massive, rapid-star-creating galaxies around 10 to 11 billion light-years from Earth, galaxies that astronomers suspect had formed inside egg-like halos of dark matter. Galaxy characteristics like brightness and stellar mass are directly related to the size of their dark matter halo, the researchers said. "Star formation is closely connected to dark matter," Cooray told SPACE.com. The scientists studied a patch of sky the size of Earth's moon in the constellation Ursa Major to make their discovery. This wedge of sky, known as the Lockman Hole, is ideal for studying objects outside our galaxy because of the low dust contamination from the Milky Way. The study's findings are detailed in today's (Feb. 16) online edition of the journal Nature and will appear in print Feb. 24. Star formation is especially high within so-called submillimeter galaxies, which are some of the most active stellar cradles in the 13.7-billion-year-old universe. (The galaxies get their name from the emissions we detect from them as they rapidly move away from Earth. The wavelength of the emissions is less than a millimeter long.) In these old, bright galaxies, new stars are created at the rate of up to a few thousand per year. By comparison, the Milky Way produces about 10 stars annually. "These are the galaxies that formed when the universe was about 2 or 3 billion years old," Cooray said. After measuring the brightness of the galaxies within the patch of sky, the researcher calculated the minimum dark halo mass needed to develop and sustain a submillimeter galaxy when the universe's star formation was at its peak. That number, 300 billion solar masses, is substantially less than previous estimates. "There could be many reasons for this," Cooray said. For example, "it could be that there are more galaxies in the universe actively undergoing star formation than assumed by current simulations." Whatever the cause, the link between halo mass and star formation will require another look at current theoretical models for these ancient star-forming galaxies, as well as galaxy formation and evolution as a whole, researchers said.